The Somali immigrant community in Minnesota, the center of the Somali diaspora in the United States, has been nibbling for years at entering the state’s politics. Heavily concentrated in central Minneapolis, in the old Scandinavian neighborhood of Cedar-Riverside, their first political success came in 2010 on the city’s school board, followed, in 2013, when a Somali immigrant was elected to the city council, and then, in 2016, when a Somali woman handily beat a long-time incumbent to get elected to the State Legislature. These new Americans political success had come slowly and over a number of years, but last night’s primary election results in Minnesota were the definitive breakthrough of the Somali immigrant population in the state’s politics. Not only did Ilhan Omar, a Somali refugee woman, who came to American when she was eight years old, win the Democratic primary for a seat in the US House of Representatives, but her seat in the State Legislature will be filled by a fellow countryman, Mohamud Noor. They both handily won their Democratic primaries, Omar capturing 48 per cent of the vote and beating the experienced former Speaker of the State House, and Noor winning with 40 percent of the vote. Both of them will represent heavily Democratic districts, and there is little doubt that they will be elected in November. The Somali election victories are truly historic and they underscore the fact that the Somalis are in Minnesota politics to stay. These first victorious Somali politicians are all first generation immigrants, born in the old country and arriving in America at various ages. As they settled in central Minneapolis, the neighborhood that used to be heavily Scandinavian and called “Snoose Boulevard” the area became known as “Little Mogadishu.” And just like the Scandinavian immigrants before them, these new Somali immigrants sought political clout using their ethnic concentration in the center of the city. But last night, Fateh only came in third in the State House District 62A, south of downtown Minneapolis. He was narrowly beaten by two other Somali-Americans competing in the Democratic primary, which was won by Hodan Hassan, a clinical worker, immigrant and a single mom. In a tight race, she captured 28 percent of the vote, beating also another Somali immigrant, Osman Ahmed, long active in Minnesota politics. As the American-born political generation is starting to knock on the door, the first foreign-born Somali generation clearly still have political clout. But the fact that a new generation seems to stand ready to take over is a most encouraging sign. 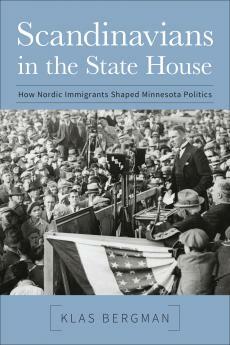 Here is a review of my book about the Scandinavian political legacy in Minnesota. It is written by Kevin Proescholdt, editor of the Swedish-American Historical Quarterly, and published in January 2018, Vol. 69, No. 1. Bergman, Klas. Scandinavians in the State House: How Nordic Immigrants Shaped Minnesota Politics. Saint Paul: Minnesota Historical Society Press, 2017. 310 pp., illustrations, bibliography, index, endnotes. ISBN: 978-1- 68134-030-2. Minnesota is often referred to as the most Scandinavian of all the United States. Tens of thousands of immigrants from Sweden, Norway, Finland, Denmark, and Iceland did indeed settle in Minnesota, and over time these immigrants exerted an enormous influence on the state, including its politics. Since 1892, for example, Minnesota has had twenty governors of Nordic descent. Between 1915 and 1976, every Minnesota governor was of Swedish or Norwegian descent except for one Finland- Swede and one Dane. And the numbers of these governors are dwarfed by the thousands of Nordics who have served in local and county positions and state legislative offices, across the state and through the decades. Two such Nordics from Minnesota have even served as vice president of the United States. Klas Bergman’s Scandinavians in the State House tells the story of the Scandinavian influences in Minnesota politics, and how those influences have shaped, and continue to shape, Minnesota politics today. Far more than just a compilation of Scandinavians who were elected to offices in the state, and far more than an uncritical filiopietistic, cheer–for-our- own-ethnic-group portrayal, this book delves into the widely varying backgrounds of Scandinavians in Minnesota, and how that diversity of experiences helped create the rich and enduring influence on the politics of the state. The books begins in detail looking at the “four pioneers” in the state capitol, the first Scandinavians to be elected governor of Minnesota: Norwegian immigrant and Civil War veteran Knute Nelson in 1892, a Republican; Swedish-born John Lind in 1898, a Democrat; John A. Johnson, also a Democrat and son of Swedish immigrants, elected in 1904; and Adolph Olson Eberhart, also born in Sweden, and elected as a Republican in 1908. Though traditionally affiliated with the Republican Party, “the Scandinavian vote was far from monolithic,” even in these early years of gubernatorial success. The cleavages among the Scandinavian voters were widened even further during the tumultuous years between the turn of the twentieth century and the end of World War I. The Nonpartisan League gained strength among Scandinavians during this time—especially in rural areas—and Swedish immigrant Charles A. Lindbergh Sr. (the father of the famous aviator) became a nationally recognized member of Congress from Minnesota and opponent of World War I. Lindbergh challenged Governor J. A. A. Burnquist (the son of Swedish immigrants) in the Republican primary for governor in 1918 amid the toxic politics of war-time repression and strident xenophobia, and eventually lost to Burnquist, splitting the Swedish vote mostly along urban-rural lines. One of my favorite chapters in the book is “Radicals in Exile,” a chapter reprinted in the April 2017 issue of this journal. This chapter provides a nice counter-balance to the image of Swedish immigrants in Minnesota as pioneer farmers like Karl-Oskar from Vilhelm Moberg’s emigrant novels. The chapter follows the lives of three Swedes—Walfrid Engdahl, Carl Skoglund, and Walter Malte Frank—who had all been blacklisted in Sweden for participation in the General Strike of 1909 or for other labor activities, and were essentially forced to emigrate. Though none of the three was ever elected as governor, all three became active in Minnesota politics via such avenues as the Industrial Workers of the World (IWW, or Wobblies), the Farmer-Labor Party (later the Demo- cratic-Farmer-Labor Party), the Socialist Party, or the Communist Party. After World War II, the author writes of the emergence of the two modern political parties in Minnesota, the Democratic-Farmer-Labor (DFL) Party, led by Nordic-American Hubert H. Humphrey; and a progressive Republican Party, a moderate and internationalist party shaped by the former “Boy Governor” Harold Stassen of German/ Czech/Norwegian descent. The author attributes much of the progressive nature of the state and its politics to the Scandinavian influences brought by the masses of Scandinavian immigrants who settled in the state and became involved with the state’s politics and public life. Klas Bergman ends the book in a most interesting way. In the penultimate chapter, entitled “From Snoose Boulevard to Little Mogadishu,” he describes how Somali immigrants of today have taken a page from the playbook of the old Scandinavian immigrants in the south Minneapolis Sixth Ward. Once a stronghold of Scandinavian Americans, the Cedar-Riverside neighborhood and the broader Sixth Ward today have become a stronghold for Somali immigrants. Like their Scandinavian predecessors, the Somali immigrants have exerted their political power, and with growing success. In 2013, for example, Somali immigrant Abdi Warsame won an impressive victory over the incumbent city council member to represent the Sixth Ward on the City Council. In 2016 Ilhan Omar, a thirty-three-year-old Somali-American woman who had fled Somalia as a child, defeated a long-time DFL member of the state legislature, becoming the first Somali American elected to any state legislative office in the country. The Somali-American immigrants of today are following the same path to political office in the same neighborhoods that were blazed by the Scandinavian immigrants of a century or more ago. There is much to recommend in Scandinavians in the State House. It is well researched (including citations of many articles from this Quarterly), well written and well documented, and the author conducted more than ninety interviews to supplement his meticulous research. It is a must-read for understanding the influence of Scandinavian Americans on the political life of Minnesota. Mondale’s answer is both a paragon of Scandinavian understatement and a telescopic view into a key component of Minnesotan identity. To put it simply, one cannot contemplate, let alone discuss, the political history of the state without repeated reference to public figures of Scandinavian background. Many Americans, Europeans, and others view Minnesota as a Scandinavian outpost in the center of North America. This impression became full blown by the mid-1970s with Time magazine’s iconic August 1973 cover story on Minnesota, “the state that works,” featuring its handsome, young governor, Wendell Anderson, grinning and holding a fish (that may or may not have come out of a freezer). Author Bergman, a native of Sweden who was educated in the United States and has spent much of his life in this country, has done an exceptionally good job of providing specifics to substantiate a general impression. Bergman boldly ventures into previously uncharted conceptual territory, methodically chronicling the tendencies, dispositions, and circumstances that led immigrants and their descendants from the Nordic nations of Sweden, Norway, Denmark, Finland, and Iceland into positions of public prominence and political authority in Minnesota. Scandinavian immigration owed much to the favorable early portraits of the state painted by Swedish writer and traveler Fredrika Bremer and Swedish immigrant Hans Mattson, who served as a Union soldier and later headed the state bureau of immigration. Bremer, who was friend to Emerson and Thoreau, directly suggested after an 1850 visit that Minnesota would be an ideal new Scandinavia: Swedes would find familiar forests; Norwegians, waters; and Danes, lush pastures. Mattson was more practical in his booster approach: the growing state could benefit from the qualities Nordics would bring, including piety, thrift, and industriousness. Bergman notes that the newly formed Republican Party resonated with these immigrants. The party was against the expansion of slavery and for the individual quest for a better economic and cultural life. Bergman also notes, however, that many Scandinavians came to North America thoroughly radicalized and immediately fell into associations such as the Industrial Workers of the World and the Communist Party. Among the meatier portions of the book are the descriptions of populism and Progressive tendencies at the turn of the twentieth century. Governors such as John Lind (1899–1901) attracted admiration for their seemingly natural ability to translate European social ideals into an American vocabulary of democratic possibilities. Bergman also provides a long- overdue reintroduction of John Albert Johnson, who was elected governor in 1904 as a Progressive Democrat. In the first decade of the twentieth century, Johnson was frequently spoken of as an ideal presidential candidate; he died early, however, succumbing to cancer in 1909 at the age of 48. Another notable point that Bergman makes in detail: Scandinavians were not and are not of one nationality nor of one mind. The history of the Nordic countries from the Middle Ages until the high period of immigration to the United States in the nineteenth century is one of conflict and even warfare. Swedes, Norwegians, and Danes tended to be closer to one another in Minnesota than they were in the old countries. The reason largely had to do with a desire for Americanization. Bergman concludes his encyclopedic study with a description of more recent immigrants to the North Star State. Hmong, Somalis, and Hispanics are examined in terms of neighborhoods, languages, and civic institutions. All such points of reference have clear predicates in Bergman’s earlier examination of the experiences of Icelanders, Danes, Norwegians, Swedes, and Finns. If Scandinavians in the State House demonstrates one important point it is that common impres- sions become more impressive when seriously explored.